A different kind of pop-up message. Not long after facing consumer backlash for its newly implemented bandwidth caps, Comcast is at it again. Now, as Consumerist reports, the company's being put on display for interrupting a customer's web browsing experience to upsell one of its new modems. According to Comcast subscriber "BB," who contacted said website, the cable and internet giant recently reworked the network in his area, which has since led to a series of emails and calls reminding him to upgrade his modem. BB, however, owns his equipment, as opposed to renting it from Comcast for a monthly fee -- and he says it works perfectly. But, apparently, Comcast doesn't agree. 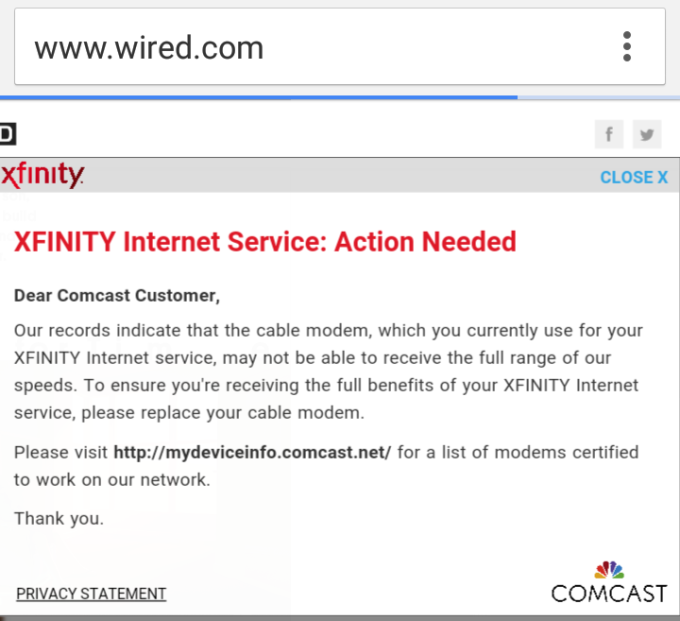 "Our records indicate that the cable modem, which you currently use for your XFINITY internet service, may not be able to receive the full range of our speeds," reads the notice sent to BB, claiming action was needed on his service. "To ensure you're receiving the full benefits of your XFINITY internet service, please replace your cable modem." In response, BB notes that "we stream Netflix and YouTube and our internet speed is great for everything we need." Consumerist spoke to an unnamed Comcast executive, who says the goal isn't to upsell a modem to users. Instead, it wants to provide an "educational tool" to advise them that their third-party modem may be too old to support its maximum internet speeds, as well as inform about software updates and bug fixes they're missing out on. Sure, the situation could just be about upgrading BB's home network to DOCSIS 3.1, the gigabit tech Comcast is in the process of rolling out, but this doesn't seem like the best way to go about it -- nobody appreciates spam. BB adds, "If they want me to upgrade my modem so badly they can send me a new one, or put a credit on my bill to pay for one that I buy myself." If not, he says he'll keep using until it no longer works. This program is a thoughtful effort by our engineers to ensure our customers are getting the speeds, performance, and security they are paying for. We have a list of approved modems customers can purchase here [at] http://www. mydeviceinfo.comcast.net/. It's really important to us that our customers enjoy the best online experience possible and that means alerting them if the device they have is either nearing the end of its life or is too old to support faster speeds.